One sunny day in Chelsea, a bride-to-be gets ready with her best friends and closest family. There’s a knock on the door and little feet rush to answer. It’s a man with a camera. Enter reportage wedding photographer Mark Carey, delighted to be greeted by the cutest of cute little girls (that’ll be bride Sam’s adorable little daughter) and set to capture a gorgeous wedding day on camera. 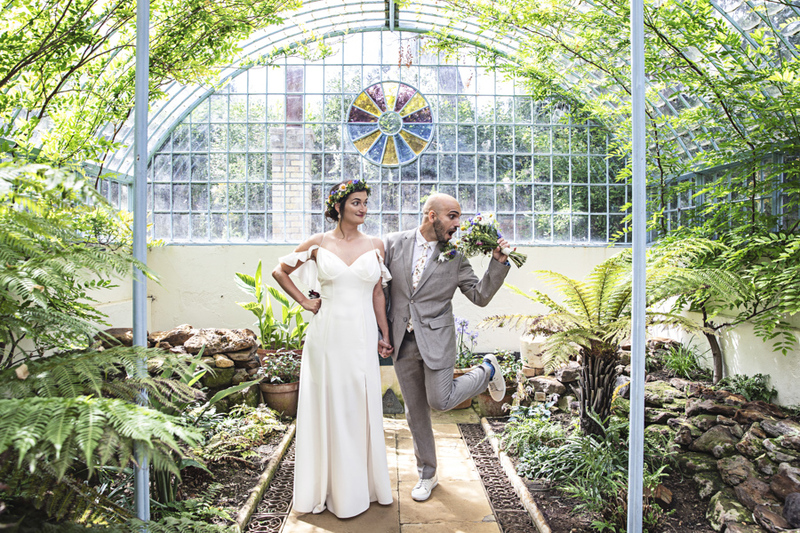 I love the story – in pictures and in Sam’s own words – of this wedding for two things. First it’s just beautiful to look at, one of those where my heart leaped into my mouth when I first saw the images! Second… Sam and Kev did things their own way and created a relaxed celebration, a fun party and a great day for their friends and family. Sam wrote a great wedding report so I’ll hand over to her to tell you all about the wedding day. Bride Sam writes, “Our first thought was that we wanted to get married without the traditional things like the wedding breakfast, table plans, cake cutting and speeches. We wanted a casual (but smart) ceremony and a big party! We chose Chelsea Registry Office because we always spend a lot of weekends up there, we like to shop in the area and because it is a very lovely venue! We then had a look at some venues for the reception and kept changing our minds about how many people we wanted, so again we went with Beauberry House because it is a beautiful venue and we spend a lot of our time in Dulwich, especially the park with the kids. “I always knew the type of dress I wanted, I loved the 50’s style prom dress and Candy Anthony was the obvious choice, I also got the 2 bridesmaids dresses and the flower girl dress from there. I wanted things to be easy, so I chose pink, white and black as a rough colour scheme, so we had pink roses for the flowers and pink bits and pieces, like ribbon around the invites, balloons, cakes etc. The wedding dress: oh wow. How gorgeous is this Candy Anthony number? The 50’s prom dress in ivory with a cap sleeved tulle overlay suits Sam down to the ground (or down to the just-below-the-knee!) Even more than with a traditional wedding dress, I imagine the second you wear one of these you must feel the wedding day magic begin! And who could resist the temptation to swish it around a few times with all the excitement?! Not me! Kev entertains the guests at Chelsea registry office before the wedding ceremony. He wears the very best in groomswear: gorgeous bespoke tailoring by Spencer Hart, Savile Row. “Then we had a great party, with excellent music by our DJ Max from the wedding smashers, we also had a singer earlier on while people were arriving and she was very cool, lovely chilled music. “Everyone said they had a great time, we had a great time, and we just wanted to have fun, so we spent most of the time on the dance floor and mingling with all our guests. “Being so relaxed from start to finish, I was nervous before hand, thinking about what could go wrong but nothing did and I would love to do it all again. We just had a great time drinking and dancing! “Keep it simple, do what you want to do, that way you will always enjoy your special day! Reportage wedding photographer Mark Carey is a wedding photojournalist serving clients in London, the UK and destination weddings. Huge thanks to Sam and Kev for the questionnaire – congratulations to you both and thank you so much for sharing. « Real wedding at Thornton Manor – movie time! Another treat for Charlotte Balbier brides out there! very very nice. Lovely to see great monochromes and intuitive camera angles. Well done Mark. From the first photo of the petticoat and dress hung up on the wardrobe I knew I would like this wedding! A beautiful dress, the bridesmaid was soooooooo cute and in a dress very similar to one I want for my tiny bridemaid.